President Moon Jae-in said Monday that North Korea leader Kim Jong-un's personal letter sent to him on Sunday contains a "positive" message that could give hints as to what direction North Korea could be headed in denuclearization and inter-Korean relations, a source said. "It has a positive message through which North Korea's directions and intentions on inter-Korean relations and denuclearization of the Korean Peninsula as well as Chairman Kim Jong-un's trip could be read," a source quoted Moon as saying during a meeting with ruling party leaders. The president was also said to explain that the presidential office decided to make public the content of Kim's letter as it determined that the letter had special meaning. The disclosure was made after getting an understanding from the North, Moon was quoted as saying. He didn't provide other details in the letter. 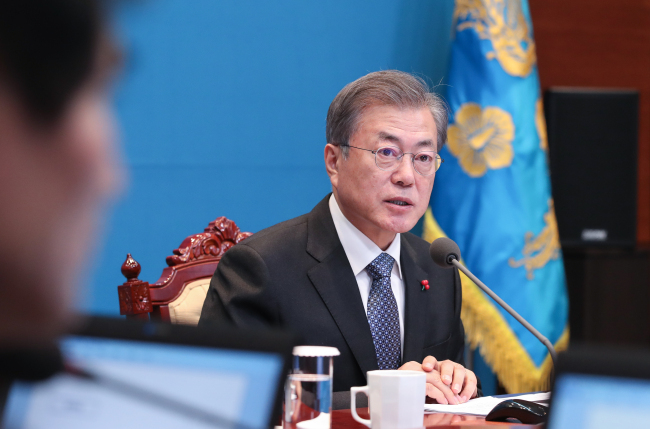 Hours after its disclosure on Sunday, Moon hailed Kim's renewed commitment to denuclearization.